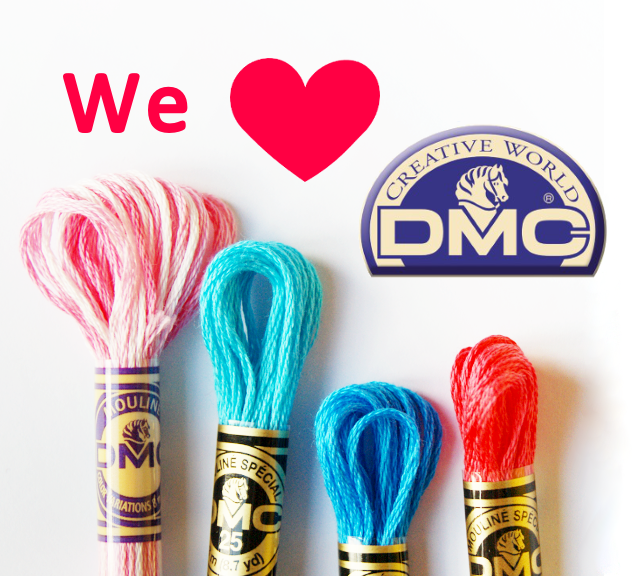 This month we're all three stitching a sampler and we hope you'll join along! We've even got a template for you. 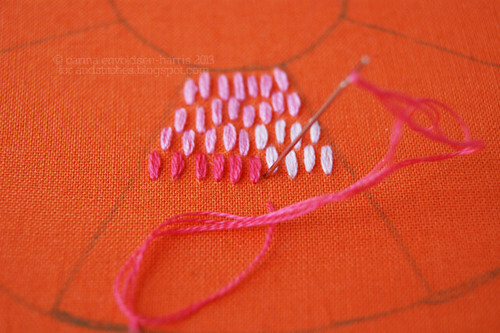 :-) Over the course of the month there will be tutorials for three stitches, which we'll of course add to our samplers. And then there's space in the template to add four more stitches of your choice. Or use seven stitches of your choice, it's all good! First make either a straight stitch or a back stitch. Then use the entry and exit points of your first stitch to add back stitches slightly to the left and right of your first stitch. And even more stitches next to the 2nd and 3rd stitch if you like. Essentially it’s a bunch of back stitches next to each other and much like a satin stitch, except you use one entry and exit point for all your back stitches. Try varying the length of your stitches and the number of threads for different results. The Granito Stitch is one of the easiest stitches around yet relatively unknown. 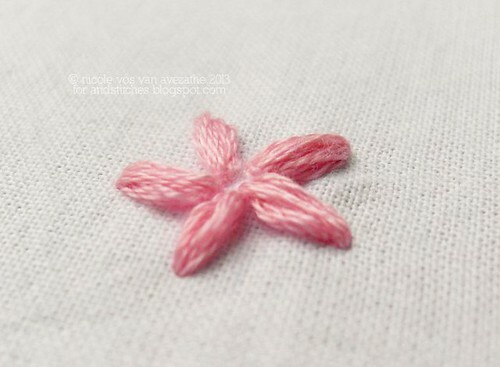 It’s perfect to make a quick petal and can be a good, fuller looking, alternative to the lazy daisy (detached chain) stitch. 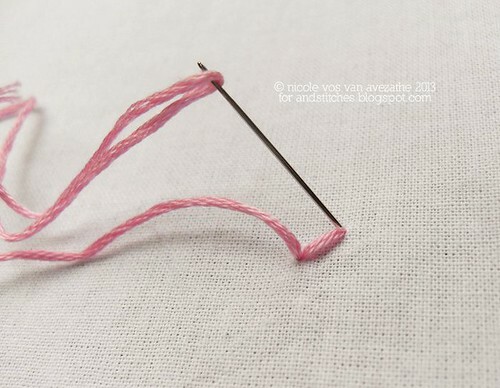 A rounder version of this stitch is also great for embroidering animal eyes. I take it that Granito is the same technique as Queen Stitch without the faffing about with tie stitches? Yay! We'll be excited to have you play along! Share photos in our Flickr group if you're a Flickr user, or leave comments with your blog links so people can see your project! 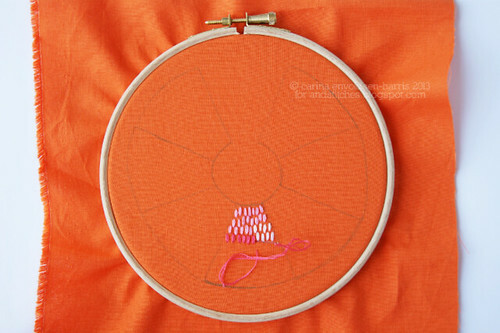 I have just been looking and looking for how to make myself a simple sampler - to teach women. Wow - am I able to print and offer this to others - for no charge, of course. I will put your credits on the copies. Thanks so very much for sharing all of this info with us. I just love it - and no, I never heard of the granito stitch. I printed the templates and I plan to get moving on this today!! Glad you want to stitch along with us, Jane! I am really tempted, but I think it might be a bit beyond my stitching abilities! Still, I think I might give it a try! Definitely give it a go! That's the whole purpose of a sampler - to learn new skills! I stitched up my granito section last night and the last rows are *way* better looking than the early ones as I picked up a tip and got the hang of it! I need another project like I need a hole in my head - another hole! BUT you have convinced me to join in and make a Garden Path Sampler! I don't get much chance to play with my embroidery wool I have been salvaging from thrifts these past couple years so this will be a great opportunity to play with them.